Tom Lees is demanding the Owls to go on another unbeaten run to resurrect their fading automatic promotion hopes. Friday’s defeat to Brighton and Hove Albion means Carlos Carvalhal’s charges trail the second-placed Segulls by 12 points. Brighton also have a match in hand. Wednesday, beaten 2-1 in a bad-tempered clash at the Amex Stadium, currently occupy the final play-off position but are only two points clear of Derby County following their hard-fought win over promotion rivals Reading. Next up for the Owls is a trip to Bristol City, who are languishing in the lower reaches of the table, a week tomorrow. 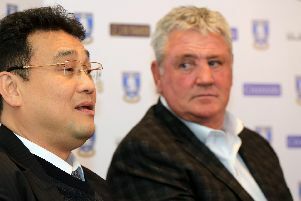 Lees said: “It’s not really good that we have a long gap between games now. Wednesday will be without Sam Hutchinson and Steven Fletcher over the coming weeks after their red cards. Hutchinson is likely to be banned for two matches after picking up his second red card of the season. Fletcher’s straight red means he will miss their next three fixtures. Lees said: “We are obviously going to have to change the team around a little bit with the suspensions. “People are now going to get a chance to play in the team and show they are ready and that they have been waiting for a chance to play.